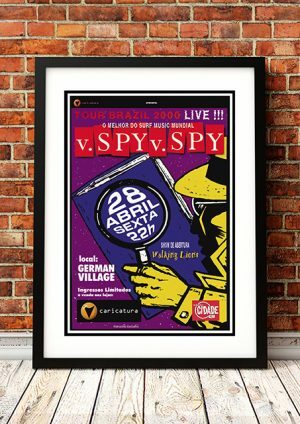 Classic Spy V Spy Band Concert Posters and Memorabilia! Buy Online Now! 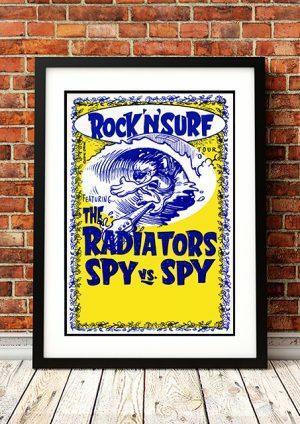 Spy vs Spy, also known as v. Spy v. Spy, The Drug Grannies and The Spies, are an Australian ska/pub rock band from Sydney formed in 1981. They became known for tackling political issues through their music, including racism, homelessness and contemporary drug culture. 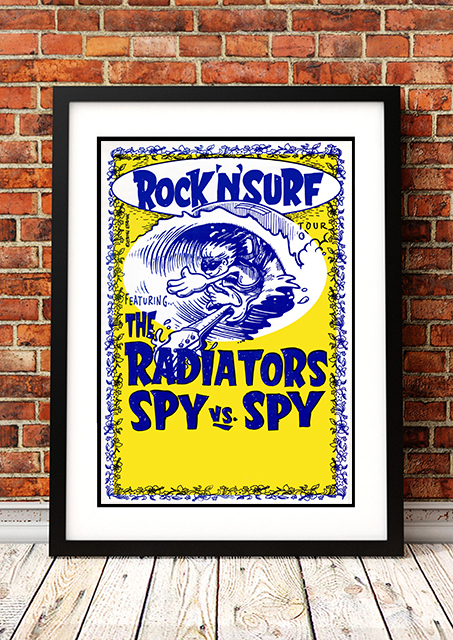 They were named after a comic strip, “Spy vs. Spy” in the US Mad magazine. The band’s initial line-up was the trio of Craig Bloxom on bass guitar/lead vocals, Cliff Grigg on drums/percussion and Mike Weiley on lead guitar/vocals. 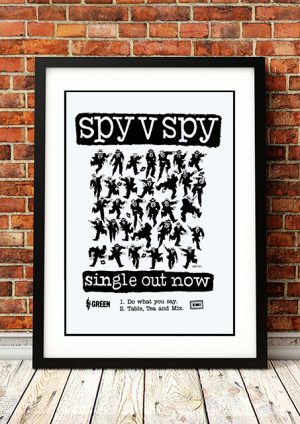 Spy vs Spy’s early music was ska-influenced indie rock, exemplified by their debut single “Do What You Say” on the independent Green label in April 1982. They released an EP Four Fresh Lemons in August. Their music became more straightforward hard rock for their pub audiences. The band broke up in early 1983 only to reform mid-year, by which time they were using the name v. Spy v. Spy to avoid legal problems with Mad magazine. They were eventually signed to Midnight Oil’s label Powderworks and managed by Oils manager, Gary Morris. Their first full-length album Harry’s Reasons was released in March 1986 and produced by Leszek Karski. They switched labels to WEA and had their highest charting success in February 1987 with their single “Don’t Tear It Down” on the Australian singles chart and the associated album A.O. Mod. TV. Vers. peaked at No. 12 on the Australian albums chart. Spy vs Spy’s follow-up album, Xenophobia (Why?) was released in March 1988 peaked at No. 15 in Australia. Their 1989 album Trash the Planet peaked at No. 22 on the ARIA Charts. None of their subsequent releases reached the Australian Top 40. The band split and reformed a number of times but still developed a strong following in Brazil. 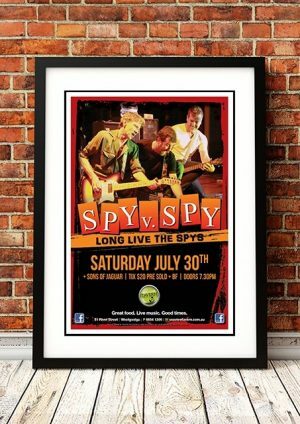 We stock some awesome Spy V Spy Band Concert Posters.